Carrara Bianco 2″ Hexagon Honed Mosaic | Out of Stock! Carrara 2″ Bianco Honed | SOLD OUT! 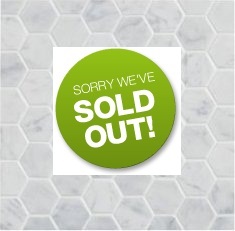 Carrara Bianco 2″ Hexagon Honed has sold out (polished is in stock). Please let us expain some of the process involved in creating a premium Italian marble mosaic. It takes over a millenium for the stone to be created in the Carrara region of Italy. It is then another seven to eight months to select and wait for the correct blocks to be excavated from the quarry. Then we have to get enough of the perfect white base gray veining blocks so that when cut they fill a container. The manufacturing time is four to eight weeks. Then shipping takes another month. The entire process (to find the perfect tiles) takes over twelve months. Then we receive the product sell for a price that is clearly to low and it is sold out within a week of arriving. Actually you can get a chinese copy remarkably quicker – but it does not look anywhere near as good. The real McCoy (so to speak) takes twelve to sixteen months. Our customers wait on backorder for three months. Availability of a Carrara white base tile is also limited this leads to the additional wait time – a gray base, second quality is a lot quicker to process. So when will this supreme product be back in stock – Back in stock June 15th 2011 – is it worth the wait? The next best thing is from Ann Sacks for $50SF – most of our customers are saving between $2,000 and $10,000 – so yes. I would wait. Calacatta Gold is one of the most requested products and we thought an update was long past due. The ETA as the title states is the end of May – “oh no” I know that is not great news especially if you are reading this in April. Finding a Calacatta quarry in Itlay is not that difficult but finding an excellent quarry is, we have turned down quite a few suppliers but settled on one which offered the greatest consistancy and continual avaliability. This Calacatta collection will not only offer the greatest value in North America but also a quality and choice that is second to none. So we at The Builder Depot apologize for the long wait but hope our customers understand why. Now here is the other issue, while the product is launched in at the end of May availablilty will be limited, it will take us until the fall to get the inventory into a position that can satisfy all the demand and that is a ‘resonable’ demand large purchases by builders or wholesalers will impact supply. While we will have good supply of Calacatta blocks for many years producing this beautiful stone will never be as easy as Carrara, inventory will always be a little spotty – so if this is something you want we suggest once you order a sample be ready to make the buying descion pretty quickly. Large format subway tiles in a running brick pattern of herringbone pattern on the floor have grown in huge popularity over the last 18 months. Large format subway tiles (larger than traditional 3×6″) have less grout lines and can create a less busy appearance. The Builder Depot offers both 6×12″ and 9×18″ and as a pioneer in large format subway tiles not only the first online store with 9×18″ but also at a price of just $8.00SF offers the lowest price for large format marble tiles in the USA. 9×18″ is generally priced at $40SF or higher. The only other online competitor is priced at $35SF and it is not a genuie Italian marble.